Can you name this Edinburgh street from the colours alone? I have taken out the shop names on this famous city street, but can you still name it? If you know click the link below to enter your answer. I will pick a random winner from all correct entries on Tuesday morning, and they will go on to the ‘Winners wall’ for the month. At the end of the month those on the wall will be entered into a draw to receive a prize. 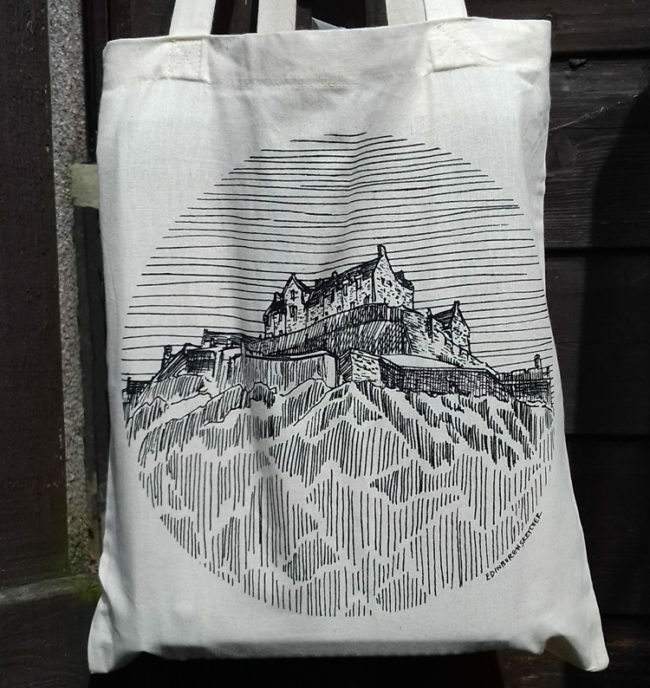 The prize for September is one of my new Edinburgh Castle Totes, featuring one of my sketches of Edinburgh Castle in a circle design. #WhereArtI 17th September answer: Dundas Street and the shop names are James Scott Antiques, Colours Gallery, and Archipelago Bakery. Jean Goodband was randomly picked to go into this months draw for an Edinburgh Sketcher tote bag. More next Monday! Dundas Street – one of those shops looks like the archipelago cafe and bakery (yummy). 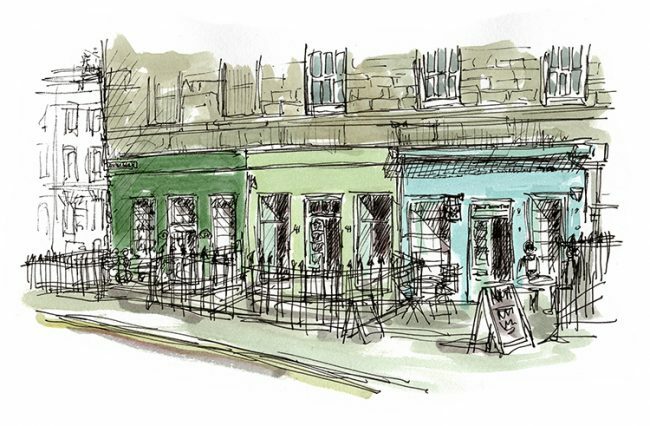 James Scott Antiques Shop, the Colours Gallery and the Archipelago Bakery at Dundas Street. Dundas Street, corner with Great King Street. My kitchen window looks out onto these three shops, so I munch my cereal with this view. It’s the east side of Dundas St at the junction with Great King St.
james Scott Antiques; Colours Gallery and Archipelago Bakery. Corner of Dundas Street and Great King Street. GSV didn’t really help with a stonking big work van and roadworks outside James Scott’s! Corner of Great King Street and Dundas Street (James Scott Antiques, Colours Gallery, Archipeligo Bakery). From left to right, James Scott Antiques, Colours Gallery, and Archipelago Bakery in Dundas Street. I used to pass these shops walking from Fettes Row to Princes Street. The return journey was a lot easier! PS That would be Great King Street in the background. St Stephen’s Street in Stockbridge?